Hey, this is my blog. Pat Sponaugle’s blog. I started this blog up at the request of my Facebook friends, who got tired of my long rambly movie reviews blowing up their iOS Facebook apps. I like to think it’s because my reviews were too awesome for the app, but it was probably something more pedestrian, like the fact that they were huge. 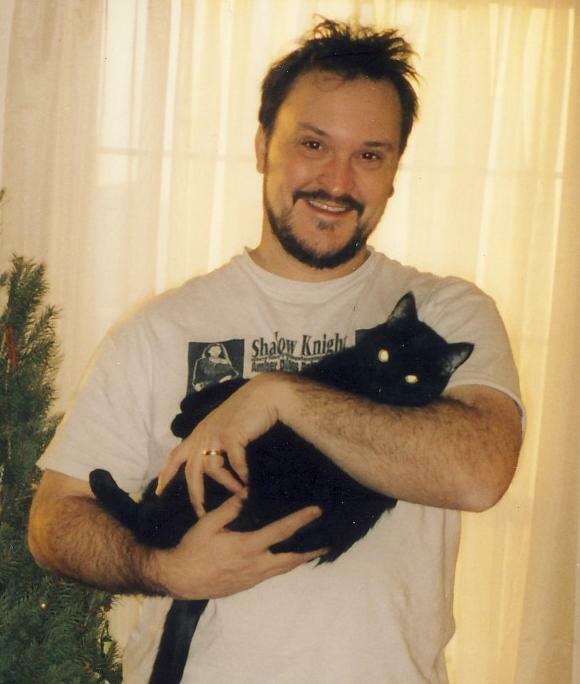 This picture was taken when I had more hair. Ah, lost youth. In my defense, my former boss gave me those pajamas for Chichi the Pug. It is very very likely that I will talk some Game of Thrones. You haven’t seen all of Game of Thrones? GO SEE IT NOW! Oh, you haven’t read all of the five published books in A Song of Ice and Fire? GO READ THEM NOW! Hey, greetings from the professor! I love the pug’s shirt! Thanks for the comment, professor! 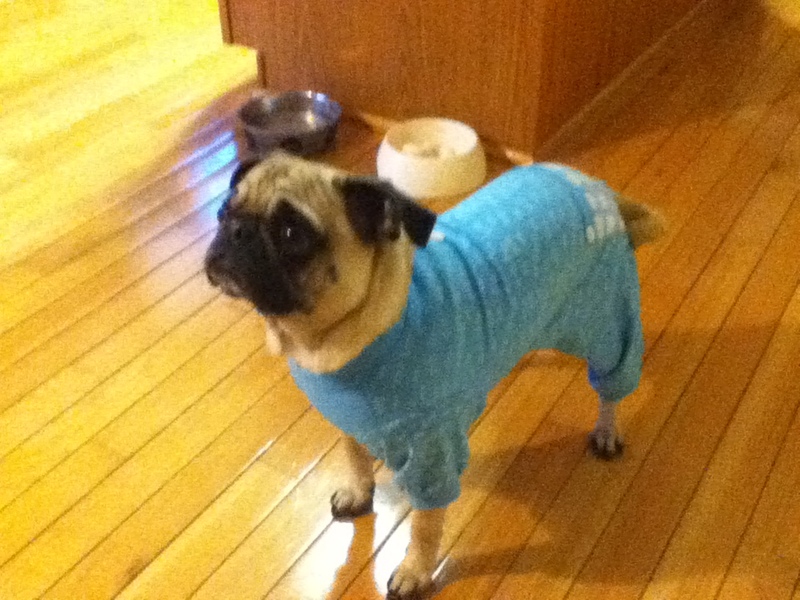 Chi Chi the Pug does look great (and sad) in those blue pajamas. I’ve nominated you for the Liebster Award! Hello – thanks for the comments and favourites on my new blog. It is very encouraging! I have remade my blog as self hosted now (still available at geekgirlreview.com) and I’ve added your blog in my blogroll. I hope that’s ok. Let me know if you have any comments. That’s great, thanks! Best regards, really enjoy your postings. so you look at every GOT related blog? i’d love to keep you updated with whatever i write about it. thanks, this means a lot to a new guy. i’ll try to keep up with the GOT stuff. Hi! We’ve nominated you for the Versatile Blogger Award! http://wp.me/p35Pkn-GL New reader but I’m loving your posts, and when I have more time (that exists, right?) I plan on working my way through your Game of Thrones archives! Which is quite a lot. Keep it up because winter is coming! Or season 4. Or both. Dave, thanks for the nomination, I appreciate it. Congratulations on getting your Versatile Blogger award! Hi Pat, glad you liked my blog post. Nice to meet another Game of Thrones fan. 🙂 I think your blog is great! Thank you very much, Sue! Thanks again for commenting on my blog, it’s much appreciated. Unless this is the most cleverest spam ever!!! 🙂 Thank you so much, Sue! I appreciate the nomination and your vote of confidence. Heard the shout out on A Cast of Kings. Thanks for supporting a great cast! Thanks Jeff, I appreciate the feedback, I love that podcast. Thank you so much for stopping by Patrick. Following you now, now that I have completed my 5 books in GoT and am in the process of watching the series (already 4 episodes in 1st season done). Looking forward for your articles. *THUNDEROUS APPLAUSE* Yay, great news on finishing the 5 books. We’re now on “Team Waiting For Book Six”. Hope you enjoy the series as well, no adaptation is perfect, but HBO’s done a pretty good job remaining faithful to the book series. Probably echoing every other person posting here- Having read the books, reseen the excellent tv series (again and again) and listened to numerous podcasts, i find the whole subject matter endlessly fascinating to discuss with anyone and anybody. Recently stumbled over your site whilst searching for future signs of things to come. I look forward to reading all the articles present and future! Thank you very, very much! I’m glad that fans of Game of Thrones drop by and comment. Glad to talk about anything and everything. And feel free to let me know what Game of Thrones podcasts you enjoy. I can’t listen to all the ones out there, but I like to know which ones are popular. The best in my opinion is Game of Owns- a mix of book and non book readers; funny, insicive. Game of Thrones Podcast from baldmove.com is also good. Anything to tic away the weeks and days between seasons and books, eh ….. Thanks for the podcast info and feedback! I would just like to point out that when I first started working out with Pat, I could outlift him. That was before his native Kryptonian powers kicked in. That has nothing to do with this blog, or really much of anything. But a man gets whatever little boosts he can. 🙂 Thanks man! Dr. Andy and I are both powered by Earth’s lighter gravity and its yellow Sun. A Sun we’ve thrown each other into on various occasions, for therapeutic reasons. Good friends will throw you a party. Great friends will throw you into the sun. Big fan of the blog, I work as Sky’s account manager for their affiliate program and think you could be a perfect fit. I don’t want to post the details publicly so it would be great if you could get in touch so we could discuss how we can work together in the future! It’s always nice to talk to a fan of my blog. I’ll send you an email at your affili dot net account so we can discuss. Hey! Thanks for stopping by Alligators & Aneurysms. I’m glad you enjoyed my post on The Dinosaur Lords. It seems you’re quite an expert on GoT. I’ve been watching the TV series and just started the books! I’ll make sure to check in 🙂 Thanks again for coming by! Thanks for your comments, it’s most appreciated. Calling me an expert of GoT is the best way to get on my good side, although I’m going to be extra-smug for awhile, no doubt. Glad to hear that the television show is getting people to read the books, which are so great. Right on! Already have. I’m as avid a gamer as ever. And I finally got on the GoT bandwagon. So I’m about as “target audience” as you’re likely to find. We’ll have to have a chat about found RPG treasures from the 1980s. Made a few of those myself recently. Dang it, Patrick. Now you know all about my sphincter control. Try to put it out of your mind and look at the Avatar. LOL! Game of Thrones is my absolute favorite! Right now, I’m listening to the audiobooks on my commute… It’s helping me get by until the new season starts haha! By the way, thanks for visiting my blog! Glad to be back! I hope you enjoy the audiobooks! I can’t wait for Season Six to start up. I mean, I guess I can… I have to. Thanks you for swinging by as well! Hey thank you for checking out my new site! I was just reading your post about Horseface and would love to discuss her at length. She’s the most essay-worthy fantasy character for days. Hope you have a great weekend! Thanks! If you’re interested, I have several other articles about Arya Underfoot on the blog. You have a good weekend too, and thanks for dropping by. Hi Patrick! I’ve nominated you for the One Lovely Blog award (http://bubblesandbeebots.com/2016/03/11/nominated-for-the-one-lovely-blog-award/). Welcome to WordPress, and thank you for visiting! Greetings to you, your blog is marvellous. Thank you very much! I appreciate you stopping by, always nice to hear from established bloggers. I was happy I found your blog as I like to discover new blogs. Nice pug, I have one of my own. Is she named for the DBZ character? Thanks! Pugs are great. But you know that. And no, she’s not named for DBZ’s Chi Chi. She was named by her first owner, a little boy who named her after one of his stuffed animals. I appreciate you stopping by, and always glad to meet a pug owner. No problem. I’ll let you get back to her inevitable snoring!